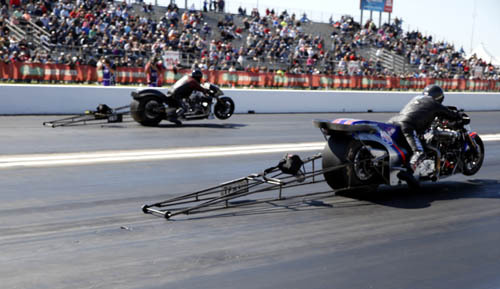 Jay Turner qualified number one in the Mickey Thompson Top Fuel Harley Series, setting both end of the track records with a 6.186 second pass at 235.93. Turner defeated Bill Jackson is round one with a good pass of 6.297 seconds. Turner faced Beau Layne in the semifinal to advance to his 16th final round. He would met Mike Scott in the final, Scott defeated Doug Vancil in round one and Rickey House in the semifinal to advance to his fourth final round. In the final Scott got the starting line advantage, but then had problems. Turner then had problems, but held on for the his tenth career win. 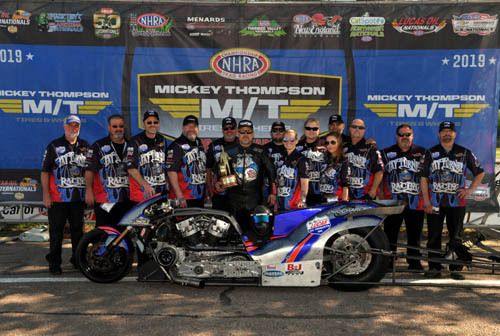 Houston marks the fourth of 12 race on the Mickey Thompson Top Fuel Harley Series schedule. The class will return to action at the 31st annual Menards NHRA Heartland Nationals presented by Minties in Topeka, Kan. June 7-10. Jay Turner celebrates 10th win. Summary of eliminations in Top Fuel Harley at the NHRA Mello Yello Drag Racing Series, 32nd annual Mopar Express Lane NHRA SpringNationals presented by Pennzoil.